The con received approximately 3 000 visitors over a warm and sunny weekend. 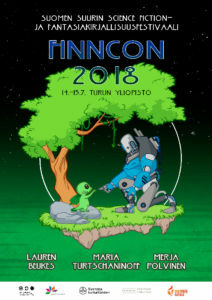 Finncon 2018 was the result of a joint effort and the connittee would like to thank everyone who took part: the volunteers, the speakers, the vendors, the associations, the supporting members and all the visitors and of course our fantastic trio of Guests of Honour, Lauren Beukes, Maria Turtschaninoff and Merja Polvinen. A special thank you goes to the arrangers of previous Finncons, who supported us during this voyage. The next chance to take part in the Finncon experience is in Jyväskylä on 5-7 July 2019. The Guests of Honour there are the translator Kersti Juva, professor Raine Koskimaa, the publisher Cheryl Morgan and the author Charles Stross. Follow the next Finncon on Twitter at @Finncon2019.